so far i have had to accept my dream boat that lives by my imaginary beach house will not be mine for many a year. if it was not a 'pie in the sky' thought, i would have it shipped back to Mossy Shed where i am quite certain it would add some 'curb appeal' alongside of our Gladys. i have also had to turn my back on the most 'loveliest of lovelies' wicker chair. it was lurking in the corner of an antiques mall. i didn't get a pic but it's enough for me to tell you it had a 'tulip' shaped base and an 'egg' shaped top half for pulses to start racing... as i 'tippity tap' about it, i am overcome with emotion as to think it will belong to another one day. i have found knitting needles galore, single and double pointed. three lovely pitchers, quite chipped and crazed (sounds familiar) but none the less, they still have star quality. i wasn't planning on buying the three but they came as a set and so, fancy that, i was forced to take all three. and some 'spiffy' books from the early 1950's, with the most wonderful jackets. and last but not least, a hefty stash of linens and more linens, not all revealed here. some in good condition and others not so... of which i plan to help 'revive' in the future so they may be enjoyed again by others. 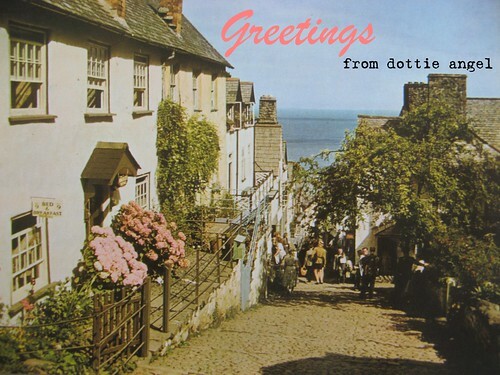 I love your photo postcards, and I can't believe what great finds you found! I have never come across that type of old knitting needle. Enjoy your Cadbury! i would absolutely LOVE to have that boat too! It all looks so lovely- what a treasure hunt! Wow, I've just found your blog and it's beautiful!!! I'm totally looking forward to having a look and read through it.!!! Oh dear! 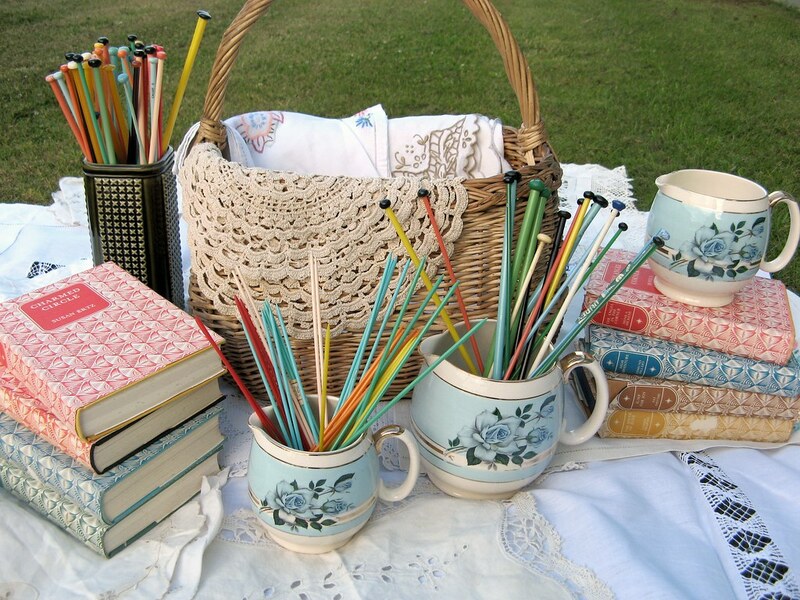 Didn't know you collected knitting needles - we ebay'd Granny's some years ago - the best were branded Durex! I see we share in the vintage love! Loving the postcards, so great!! I too have a thing for postcards! I was really feeling for you before I got to the bit where you actually got to buy stuff. The books are sublime bits of 'jacket' art! 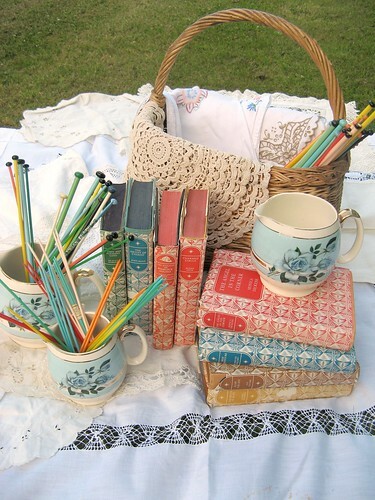 Great finds, and the basket is so perfect for your squares, Love the jugs... Blue is so my fav colour. Loving your travel journal! Last time I traveled far from home, I had to ship lots of things by mail as I got way too carried away finding 'finds'. I know you're terribly busy right now, but I've passed on a blog award to you. So when/if you have time to mess with it, it's there. PS: keep shopping...ship it all by container...WEEEEE!!! I'm enjoying your postcards! Now I want you to come and give me a makeover. I love all of your outfits and I think I have exactly three skirts and two shirts for summer! I love the knitting needles. I've been kicking myself the past couple of weeks.--There were a bunch at an Estate Sale I went to that weren't priced and I forgot to ask about them due to the large pile of other goods I'd accumulated while I was there! oh I looove those pics! 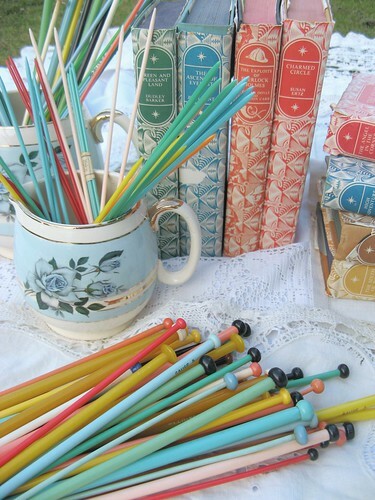 All the colors of the knitting needles and books.... so lovely! I adore your blog and your site. Looking at your Bench Monday pics on flickr too was a treat, and gave me inspiration for a project I've been working on. It is always nice to see someone who really 'gets' visuals in the way that you arrange things in your images. Great job! 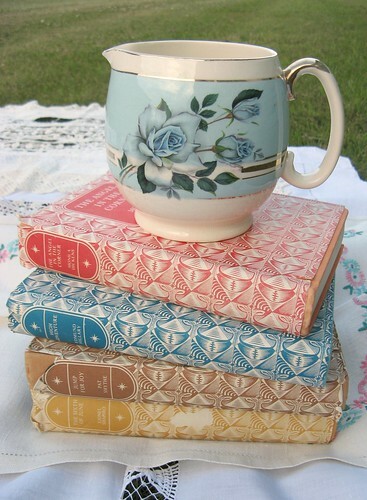 love your vintage scores - as to getting them home, i see a visit to the post office in your immediate future! sounds like you are having a blast, luckeee.